Two Portsmouth-based naval ships are helping to assess the damage and provide emergency assistance behind Hurricane Gustav in the Caribbean. 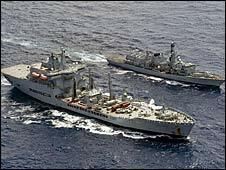 Frigate HMS Iron Duke and RFA Wave Ruler are sending up helicopters to survey the area and are offering first aid, water and food to victims. They will also help clear up and restore local infrastructure. Gustav has already struck the Dominican Republic, Haiti, Jamaica, the Cayman Islands and Cuba killing more than 80 people. It is now heading towards America's North Gulf coast, from Texas along to the Alabama-Florida border. HMS Iron Duke was due in Port of Spain in Trinidad over the weekend but has cancelled the visit because of the hurricane. Commander Mark Newland, Captain of HMS Iron Duke, said: "We may be required to provide engineering support, we may be required to provide some form of manpower support in clearing culverts and clearing roads. 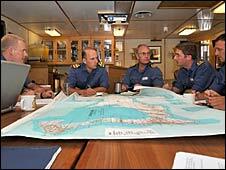 "We can also provide emergency medical support and all that Iron Duke and RFA Wave Ruler can provide. "What we bring is a range of skills coupled with professional and motivated sailors, who if faced with difficult circumstances are able to assist." HMS Iron Duke has been deployed to the Caribbean region since late June and has been involved in counter drugs work with the US Coastguard. Prince William spent a five-week attachment onboard the frigate during this time and was involved in a seizure of cocaine valued at £40m in July. He also took part in a hurricane disaster exercise during his attachment.